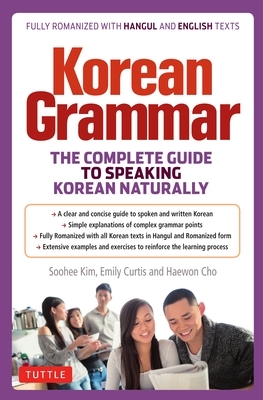 Korean Grammar: The Complete Guide to Speaking Korean Naturally covers all the basic sentence structures, verbal forms and idiomatic expressions taught in the first two years of a college-level Korean language course. Each chapter provides clear grammatical explanations with charts and examples for each construction, showing how it is used in various contexts. All Korean words and sentences are given in both Korean Hangul script and Romanized form, with English translations to assist beginning learners. Fundamental concepts like honorifics, formal and informal speech styles, verb endings and complex sentence constructions are all presented in simple and clear terms to make these constructions accessible to learners at every level. Exercises at the end of each chapter reinforce the learning process. Soohee Kim received her Ph.D. in Linguistics from the University of Washington, where she taught Korean language, culture and linguistics for 17 years. She enjoys learning new languages, some of which include Lushootseed and Italian. She is the author of Korean Flash Cards and the lead author of the Korean textbooks You Speak Korean! and Easy Korean. Haewon Cho is the Director of the Korean Language Program and a Lecturer in Foreign Languages of Korean in EALC at the University of Pennsylvania, specializing in Korean language pedagogy and business language instruction. She has extensive teaching experience and has taught all levels of Korean language courses at various institutions such as University of Michigan and Middlebury College. She is a co-author of You Speak Korean, Korean Grammar: The Complete Guide to Speaking Korean Naturally, and Easy Korean. She holds M.A. degrees in Linguistics and Teaching ESL from the University of Washington. Emily Curtis holds a Ph.D. in Linguistics and an Ed.D. from the University of Washington. She teaches courses in general linguistics, phonology and morphology at Western Washington University and is a consultant in intercultural communication and language pedagogy. Her research interests are in phonology, heritage language and metalinguistic awareness. She has studied French, Japanese, Korean, Mandarin, Spanish and Lushootseed and is the co-author of the Korean textbook series You Speak Korean! as well as Easy Korean.